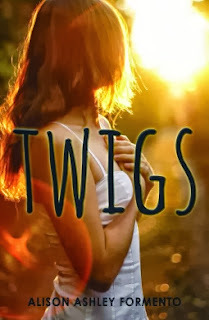 Twigs had the disadvantage of being read immediately after UnSouled by Neal Shusterman. Which was one of my favorite books of the year. I read Twigs while I was in a book-hangover state, knowing that I was bound to view it unfairly after reading UnSouled. I should have taken my own advice and "not" read a review request right after UnSouled, but I'm not great at taking advice. Even when it's my own. Especially my own. Anyway, Twigs is about an 18-year old girl named Madeline but who is called Twigs because of her tiny size. I liked Twigs as a character and liked her thinking about life. She is honest with both herself and everyone around her. Think about it: how many people make a habit of always saying what they think? Not many. But Twigs does and that was my favorite part of her character. What made this book special was the way Formento developed the characters. Everyone had a distinct purpose in the book and added a lot of depth to the story. My favorite character was Helen, just because she was so unpredictable. I felt like Twigs moved slowly. It was a long book for a contemporary NA read, and it got kind of bogged down in the middle. All the action happened at the end, and I would have liked more of the "after," instead of most of the book being about the journey. Although that may have been Formento's point: life is about the journey, not the destination. Overall, I enjoyed Twigs. I probably would have liked it even more had I not read UnSouled the day before Twigs. I enjoyed Formento's writing and would read her again.